After a heavy rain, it can be frustrating to see pools of water standing in the yard for days on end. Excessive water that puddles and pools around the property creates a muddy mess that ruins the beauty, health, and vitality of your landscape. And worse yet, if the water ends up draining to the wrong places, it can cause damage that could end up costing you more than you’d ever bargain for. How do you know when you’ve got a landscape drainage problem? Flooding- Flooding is a common issue caused by landscape drainage problems. If the lawn isn’t graded properly, it can cause water collect in some of the most inconvenient locations. Persistently soggy areas make it incredibly difficult to mow the lawn. Long-standing water attracts mosquitos and other insects that can be irritating and harmful to people, wildlife and surrounding plant life. 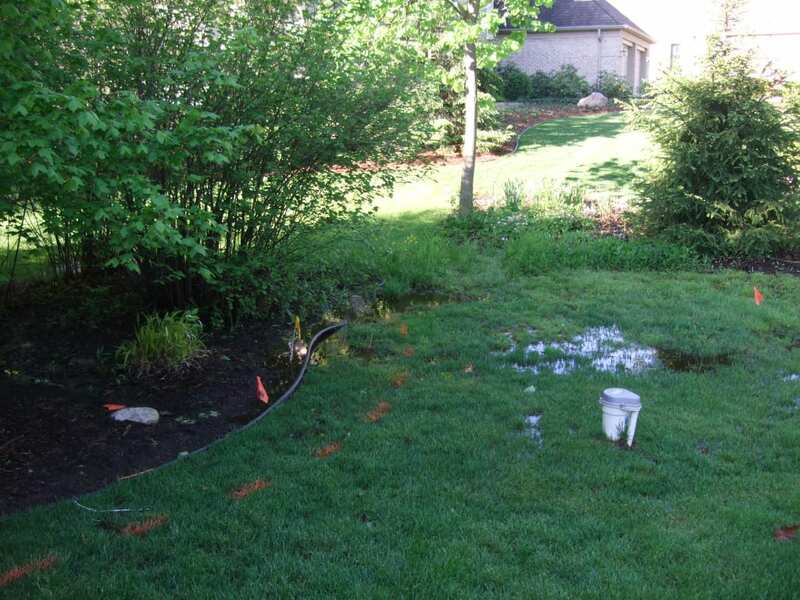 Property Damage- When the landscape’s grading is improperly directed toward a home, building or other structure, excessive water can cause significant property damage that requires time and money to clean up. Water that collects along the base of a house can compromise the structural integrity of the foundation. It can also cause leaking or flooding into a basement, damaging any property inside. Repairing property damage caused by improper water drainage could cost home and business owners tens of thousands of dollars they don’t have. Who wants that? Soil Erosion- You might be thinking, “What’s the big deal with a little loose dirt in the yard?” Soil erosion is actually a significant issue caused by improper landscape drainage. Soil erosion can affect the stability and structural integrity of trees within the property by compromising the foundation where roots need to grow deep in the soil. Soil erosion will also not allow grass to easily take root in the affected areas. Root Rot- Soil erosion isn’t the only symptom of improper landscape drainage to be concerned about. Root rot is a serious issue caused by excessive water that collects in the ground surrounding trees and other plants. The excess water doesn’t allow roots to get the air that they need, causing them to decay. Trying to save dying plants can be difficult and timely. Trees with decaying roots can be a safety hazard to nearby structures and to pedestrians on the premises. A Constantly Running Sump Pump- A sump pump is installed under your foundation is designed to pump out excess water from your basement if some breaks the barrier of your foundation walls. This should only happen periodically. However, if you discover that the sump pump is running continually, then you can take that as a sign that you’ve got a landscape drainage problem outdoors. If water is leaking into your basement or pooling around your house’s foundation, the issue could be a sump pump discharge problem. Your downspouts could also be a contributing factor. Consider redirecting downspouts further away from the building, or in a different direction to see if that doesn’t correct the problem. Are there pools of water that consistently seem to appear in the same locations of the yard and never seem to quite go away? If so, you might need to look at your sprinkler system. If a sprinkler system is not timed correctly, it could be over-watering your yard beyond its saturation limits. Are your sidewalks, patios or other hardscapes collecting water? If the answer is yes, the cause could be an installation error. These types of hardscapes must be installed with the proper slope -one ideal for pedestrian travel without compromising safety or ease of use- in order to prevent water from pooling on the surface. Look at your property’s grading. The slope or contours of your landscape should allow for outlets for excess water. If the lawn has been graded improperly, then excess water will seek out any possible location to settle. 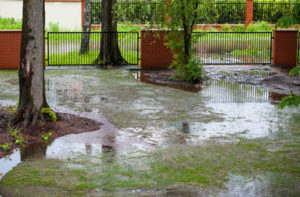 If this a problem that you need corrected, a professional landscape architect can help find the right solution to prevent future drainage problems. Is standing water in your yard a result of runoff from a neighbor’s property? This might be something that can be easily corrected through a conversation with your neighbor and a landscape engineer. If a mutual understanding can’t be reached, a professional landscape design team can help you find a solution that will fit your needs and budget. Your soil itself could be the source of your landscape drainage problems. Too much water resting on the surface of your landscape can cause the soil to become compact. Once the soil has become compact, water does not easily absorb into the ground, leading to standing water on the surface and continual soil compaction. It’s a cycle that can be difficult to break. How do you solve landscape drainage problems? There are many simple fixes that should be your first line of defense against drainage problems. Speaking with a landscape engineer or architect can help you discover which options might work for you. Redirecting or extending downspouts cost very little money and are a simple DIY step you can take to help reduce excess water pooling. Changing your gardening or watering habits could also impact how your landscape retains or drains water. Other solutions may be more extensive and require professional help to construct. Create a drainage plan by sketching out your landscape, its contours, and any plant life, hardscapes or structures that may be located on the property. 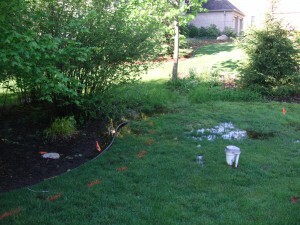 Professional help can ensure that the proper plan is created to redirect water flow across the landscape. Build a rain garden to intentionally collect the water on the property. If there is a low-lying area that consistently holds water, this would be a natural location to install a rain garden. By adding key landscaping features, appropriate plant life, and other decorative installations, your muddy, soggy grass area could become a prominent feature on the property. Installing a creek bed on the property offers a practical solution like that of a rain garden. By directing excessive water flow to a specific installation on the property, you’ll turn that frustrating water problem into a beautiful feature that can be showcased to enhance the aesthetic of the landscape. Adding a drain pipe or a French Drain underground can be one of the best ways to get rid of water from a low spot within the property. An underground pipe that slops downhill away from residential or commercial building structures is a simple way to redirect water safely and efficiently. A French Drain is one variation of such a pipe; this version is perforated and allows water to disperse out from the pipe into various material types in the surrounding soil. No matter what solution you choose, it’s important to address landscape drainage problems quickly and completely. Problems that are left unaddressed can lead to a domino effect of other costly issues down the road. Fixing the problems early on after discovery can potentially help save you tens of thousands of dollars on future problems. An initial consultation to discuss any landscape drainage problems on your property is one opportunity you won’t want to pass on. Got water drainage problems? Twin Oaks Landscape wants to help you put an end to your water drainage woes before it’s too late. Contact us today to discover the best options for your property.